Digital billboards have been a bit of a controversy in these parts since a few of them sprouted in Minnetonka, St. Paul, and along I-494 near Mendota Heights. Opponents have expressed concern that the rotating ad images would distract drivers. It was only a matter of time, however, before the operators figured you could do more with them than just runs ads. You could run… news, or — in the case of South Carolina — election returns. Will that increase the odds of an accident? Perhaps not. The South Carolina Department of Transportation analyzed the accident rate near the billboards and found out that the rate went down when the billboards went up. The election results idea didn’t start in South Carolina. 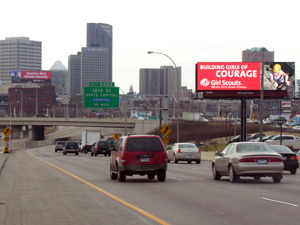 Last week, the digital billboards in Michigan carried primary results. And caucus results in Iowa were also “broadcast” on the electronic signs. A call is out to Clear Channel Outdoors in Minnesota to see if the idea will be tried here.